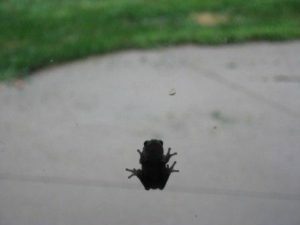 You know it is humid in Iowa when even the frogs want to come inside. I opened the door last night to see a tiny frog clinging to the screen door hoping to get a blast of air conditioning, and Steven found a family of frogs living on top of the shop light. (I’m not sure he appreciated the flash on my camera.) We have had over 9 inches of rain since Saturday morning and today promises another 1-3 inches. All joking aside, the rivers are out of their banks and Vinton and Cedar Rapids will experience flooding starting tomorrow. Prayers that homeowners don’t have any damage. 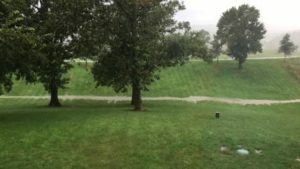 We are nice and safe on our tall hill — except from the animals trying to get out of the rain!